Notable Recipes per 101 Classic Cookbooks (2012): Cassoulet de Toulouse, Chocolate Cake, La Bouillabaisse, p.351, Poulet a l'Estragon, p.504, Quiche Lorraine, Tarte a l'Oignon, or Zewelwai, p. 416, Terrine de Campagne, p. 560. Excellent! My favorite potato leek soup recipe. Simple and good, even though the technique is a bit elaborate. The herbed butter is a nice finishing touch. Good score on the effort versus results scale -- tastes nice and is very easy to do, especially if you have a jar of Navarran piquillo peppers to hand -- less than half an hour. I used merguez instead of chorizo and upped the amount of red peppers -- I used 3 out of the jar (piquillos are small). A glug of Pedro Ximenez sherry in the sauce was not unwelcome. A great side-dish, loved by everyone in the family. Easy to make, too. Very basic, and very good. Great with an omelet and a salad. Leeks also excellent prepared the same way. Good any time but particularly in the winter. It is worth doing the layering and cutting the way she describes. I have never flamed the wine and I often cook it slowly on top of the stove (electric burners). A beautiful recipe. So easy and so delicious. I don't flame the wine either. Stupendous. Gorgeous. Hideously bad for you. You won't much care. Very rich, but such a classic. Use good pork - cheap pork makes it woolly and not as good. So simple but so good. I absolutely love this recipe; it's one of my favourites for using up cooked chicken, guinea fowl, or turkey. Do follow ED's directions for the sauce even if they seem unnecessarily fiddly -- they make all the difference. This one is more of a real dessert than her version in Italian cooking. Very good either way. Very sparse instructions - you already need to know how to make a custard. It doesn't need an ice cream machine, but freezes quite hard so you need to take it out of the freezer about 10 minutes before serving to make it scoopable. I would have preferred a stronger apricot flavour: if I make it again I will add half a dozen dried apricot halves to the fresh ones when I cook them. p. 458 - Agree wholeheartedly with emiliang's note. Gauge sugar on peaches. I used 1/3 recipe amount and still on the sweet side. This softly set preserve is just about the simplest approach to capturing the flavors of summer. 18 peaches yielded 5 jars of preserves. No lemon juice and no pectin -- just ripe peaches and sugar. Heavenly on fresh bread, croissants, or cheesecake. This wasn't bad at all, a bit different from the usual ways of cooking bacalao/salt cod. No quantities are given, but you need quite a lot of onions and shallots to thoroughly cover the fish. It has a tendency to be a bit dry, but this could be solved by serving it with a tomato side dish -- baked or stewed in olive oil for example. Don't over-soak the cod; it still needs to taste a bit salty. Also -- forgot to mention the most important thing -- the recipe suggests you bake the cooked salt cod for an hour. Far too long. I baked the onion mixture for about 20 minutes, covered in foil, then added lightly poached cod and breadcrumbs and baked for a further 20 minutes uncovered. 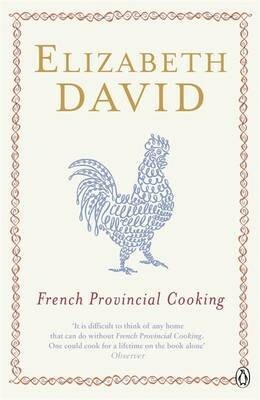 'It is difficult to think of any home that can do without Elizabeth David's "French Provincial Cooking" ...One could cook for a lifetime on the book alone' - "Observer". Elizabeth David succeeds in inducing a desire to use each recipe as soon as it is read. Whether she is describing the preparation of a plain green salad, or the marinading of a haunch of wild boar, she writes with the same imaginative directness. Recipes like 'pot au feu' are described in all their delicious simplicity, which, it is made clear, means cooking without elaboration and has nothing to do with the higgledy piggledy 'let's hope it's all right' technique. Some excellent advice is included on the choice of the tools that would always be needed in any kitchen. Is There a Nutmeg in the House?